…but not to worry! The very proper and demure Lactaid Cow appears, propels her ill-mannered sister roughly to the side, and launches into a subdued conversation with the woman about how that milk was really messing with her. You see, Lactaid is real milk that won’t mess with you. 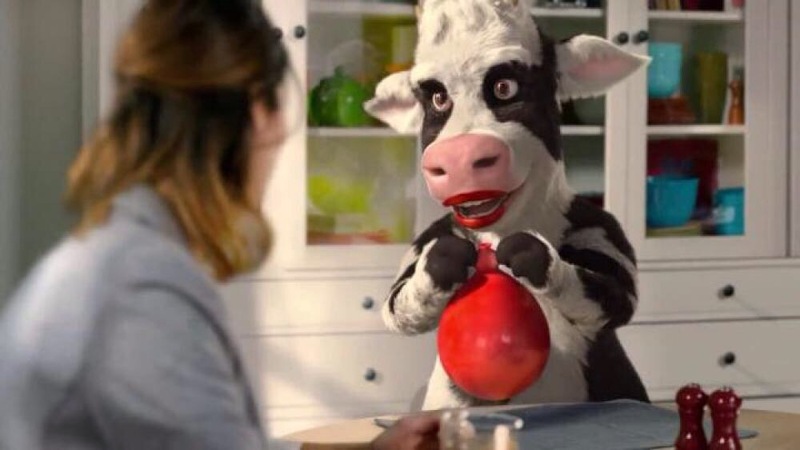 For entertainment value, however, I continue to prefer the Annoying Milk cow, who wears red lipstick and appears slightly demented but very capable of doing a manic stand-up comedy routine… no use crying over a little spilled milk, right? This entry was posted on December 10, 2016 at 2:12 am and is filed under absurdities, anthropomorphic, Brilliant but twisted, furry, furry commercials, television. You can subscribe via RSS 2.0 feed to this post's comments. Who says stand-up “cow-medy” is dead? P.S.—I won’t blame you if you have a beef with that pun. And the winner of the 2016 “Scary Dairy” Award is…Ann Oying!!! Speaking of annoying: have you seen that CGI Xmas special, this year? It’s where Norm McDonald plays the voice of a flying squirrel helping a reindeer yearling get to the North Pole (to prevent a sneak attack by a venison-addicted wolf pack). The dialogue includes one of those songs that are so bad, they’re good! “We’re reindeer. We’re not horses. I haven’t seen it, but from your description it’s probably just as well! P.S.—Merry Belated Xmas and Happy New Year!!! True story: I was at one of my two favorite comic shops, today (Industry Comics of Bristol, CT, in case you permit unsolicited plugs); and they had this poster in the window. Which, by the way, was in the form of a pictographic rebus! Then, you better get ready for a relapse. Given his cameo at the end of the first GUARDIANS OF THE GALAXY, he might just be returning for GOTG2….which is already showing trailers, in theaters, intermittently! OMG! I can’t wait to see Rocket Raccoon again!